Raw 25 is a week away and many of us are excited I'm sure. 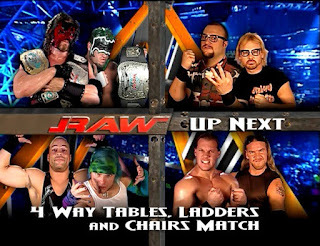 With that in mind, I wanted to briefly take a look at 5 matches that were classic during the history of RAW. RAW has had some amazing matches and the list is extensive, but these 5 choices are some of the absolute best. Let's get into it. -When we look back at this match, there is a lot to discuss. For one, Kane was without his partner The Hurricane. Two, this match features three men who took part in the first three TLC matches, but with new partners. Three, this was a part of the Raw Roulette that went down, so this match was a special treat. The spots were well executed and the crowd was live for this one, as each team attempted to walk away with the RAW tag team championships, but only one man was left standing: Kane. That's right. TLC 4 ends with Kane defeating the other 3 teams to hold onto the tag titles. 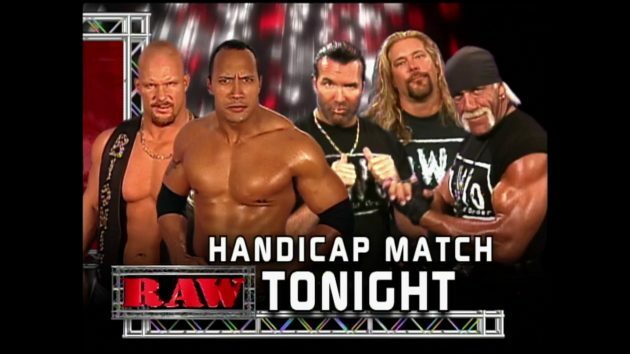 Of the era of RAW that many people disliked (2002-2003), this was a definite highlight. -This match is one of the greatest tag matches in the history of the show, but it is a stand-alone classic as well. 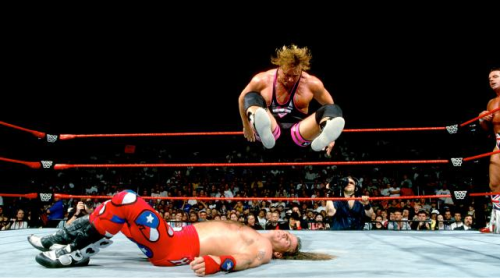 Owen and Bulldog were the tag team champions and Austin and HBK were a makeshift team that many didn't expect to work well. This match took place on my birthday, and I remember watching this live. I was excited to see Austin and Shawn team up and what we would get is an amazing match between four men who were at the top of their game. The whole aspect of the Hart Foundation being involved and Bret Hart in the wheelchair during the match was great and the moment that HBK hit the Sweet Chin Music and the three count was made, the crowd erupted for a legendary RAW moment. The beginning, the end, and the aftermath of this match is truly classic. -One of the toughest matches to revisit for multiple reasons, this is the greatest match in RAW history IMO. It is not only the greatest match in RAW history, but in terms of tag team matches, it might be top 3 of all time. Benoit and Jericho were hitting their primes in the ring and Austin was in the middle of his greatest year in the ring while Triple H was still at the top of his game. Through 20 minutes of intense action, it seemed as if neither team would budge. Unfortunately, following Triple H suffering his quad injury, the match would end soon after, with Benoit and Jericho picking up the victory. Truthfully, I wish the Triple H injury never happened, as I believe we could have seen 2 to 3 more minutes of this legendary bout. -The NWO was a force to be reckoned with. Austin and Rock had teamed before, but they had never seen a force like the NWO. With Nash, Hogan, and Hall going against Austin and Rock, two of the greatest ever were at a disadvantage, but they held their own for most of the match. The action was just electric, as seeing Hogan and Austin do battle, Rock and Nash, as well as Austin and Nash was a lot of fun and with Hogan vs Rock on the horizon, the finish would likely be tied into that match and sure enough, Hogan would pick up the 1-2-3 over Rock in this battle. This is still one of my favorite matches on RAW and a true dream match at that. -A slept on match (and I think the elimination match between the teams a few months prior was just as good), this showed the volatile battles that these men would have and how the end of Evolution was fast approaching. With Edge and Orton coming off their match for the IC Title, and Benoit getting ready for his battle at Summerslam with Orton, this match was intense and would set the tone for what was to come. From Flair and Benoit trading chops to Batista imposing his will and strength, as well as Jericho adding his element of speed and skill, this match had it all. 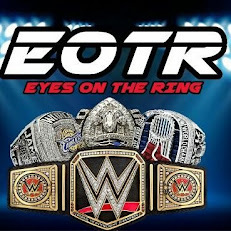 Orton picks up the win for his team after the RKO on Benoit.